More time spent in the Mass Effect universe is always welcome. ioWare's Mass Effect series has provided the most complete and balanced gaming experience yet to be made. The incredible variety of options and characters provides for nearly every want and interest represented by an equally diverse community of gamers. Little could be added, and even less could be taken away, that would maintain the finely tuned feel of the finished product. Still, in the era of downloadable content, developers seem increasingly eager to offer up extra morsels, each for a modest fee, in the hopes of squeezing a little more out of each cash cow. Not all of the new options are worthwhile. For me personally, the chance to obtain a new outfit for a game character rarely piques my interest. New weapons draw my attention slightly more, but I've never found them to be vital to the experience. New characters are a completely different issue. Adding an entire person to a story brings much more than a change of appearance; it brings an entirely new perspective from which to view the world. The potential impact of such an addition is huge but hinges largely on the nature of the character being introduced. Zaheed the Bounty Hunter brought a seething anger and a tale of vengeance but little else and as a result, quickly grew stale. That said, his being free-of-charge made his shortcomings completely forgivable. Charming and direct, confident without arrogance, Kasumi Goto clearly enjoys her position at the top of her game.The story of Kasumi Goto, found in the latest DLC Stolen Memory, will set one back 560 Microsoft Points, or about $8. While this isn't the highest price ever asked for new content, it is still a significant sum. Is it worthwhile? Let's take a look. The main draw to the new content is clearly Kasumi herself. Charming and direct, confident without arrogance, this young woman clearly enjoys her position at the top of her game. Her personality has a draw that Zaheed's never did. Her unique skill, the ability to make cloaked strikes against any target on the field, is also more useful than his making her more of an option for use in the main campaign. Zaheed, by comparison, never saw action outside of his loyalty mission. As downloads, neither character is capable of conversation instead only offering short statements and observations when questioned. Despite this limitation, Kasumi manages to be endearing and worth a repeated poking. Such a personality makes Kasumi's background and story that much more compelling. Formerly half of the galaxy's most accomplished team of thieves, Kasumi and her partner shared bonds far stronger than the typical couple. Each had been wired with a neural implant capable of storing memories and experiences with the ability for instant recollection, and each box stored precious memories of the love shared between them. Unfortunately, her partner was privy to information of such a sensitive nature that it lead to his death, and the plundering of his implant's lifetime's worth of knowledge and experience to be gained. Kasumi is out to recover that which was stolen and exact revenge, both for her lost love and his cherished memory. To this end, she pledges herself to Commander Shepard, on the condition that he assist in the greatest heist she has ever pulled. What follows is perhaps the most creative loyalty mission available in the game. Kasumi is out to recover that which was stolen and exact revenge, both for her lost love and his cherished memory.A welcome change of pace from the usual combat-heavy loyalty missions, Kasumi and Shepard must crash an exclusive dinner party, hosted by the mercenary collector Donovan Hock. 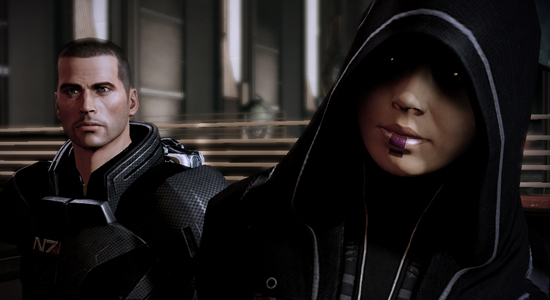 Using an assumed identity, Shepard must seek out and infiltrate the heavily secured treasure vault, bypassing three distinct barriers to achieve his goal. While each problem comes with a fairly obvious solution, patience and exploration can provide slightly more desirable methods than going with the first available choice. Inevitably, the vault is accessed, the target acquired, and the cover blown. Shepard and Kasumi then launch into a hard-pressed escape attempt culminating in a standoff with yet another hovering gunship. The usefulness of Kasumi's Shadow Strike ability is immediately apparent and fun to watch. The introduction of the flashbang grenade as well as a new submachine gun provide game-wide benefits as well. When the gunship is dispatched and the dust finally settled, the player is then treated to a touching reunion between Kasumi and her former companion at the end of a job well done. What Stolen Memory reduces down to is some extra frosting on an already lavishly decorated cake. For players obtaining the download early on in the story, the additions become useable for a much larger part of the game which may make the eight-dollar price tag more acceptable in the long run. Those of us who enjoy the occasional Easter egg should find the embedded nod to Dragon Age amusing. For those like me who are in it more for the story than anything else, the DLC delivers a highly enjoyable experience. Sure there's a little higher cost, but more time spent in the Mass Effect universe is always welcome, isn't it? As I am playing Mass Effect 2 again for another run (On the PC this time). I have found Kasumi to be a valuable asset in game. The "Shadow Strike" ability is , as you say, very entertaining to watch. It is also quite useful for distracting an enemy who is almost on you while your health is low and great for getting the rid of that last annoying opponent who you don't want to expose yourself too. Kudos to Bioware for this DLC. Hopefully there will be more. While I haven't played ME2 yet, I definitely appreciate the unique approach Bioware is taking with its add-on content. The fact that these are playable characters which can join your "away team" in the game's main campaign would make them a compelling purchase. Part of me is disappointed that, from the sound of things, new characters like Kasumi aren't better integrated into the core storyline (with sound bites, CG sequences, etc. ), but overall, I'd say the price sounds right for an add-on like this. Ed, the second entry FAR exceeds the first in every possible category. If I can find myself a new copy of the collectors edition, I'd even send you my old standard, because it MUST be played.